Get Your Warchief Election 2010 Buttons! 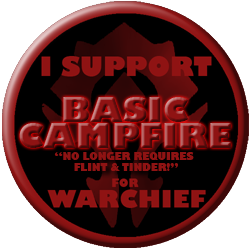 Posted on June 1, 2010, in Warchief Election 2010 and tagged basic campfire, deathwing, garrosh, richard knaak, thrall, warchief election. Bookmark the permalink. 6 Comments. .-= Anea´s last blog ..In which I ramble on (as per usual) =-. Hey! There are no women up there!! >:-( My vote is for Conqueror Krenna! .-= Suzanna (aka Stardancerelf)´s last blog ..015 Hearthstone Tavern RP- The Storytellers =-. That and I couldn’t think up a funny campaign slogan for Garona or Magatha.